Your Android phone probably takes brilliant photos, but even great shots can usually benefit from a little tweaking – which is where a great photo editor comes into its own. Subtle changes like cropping to improve composition, straightening horizons, correcting color casts, erasing blemishes and boosting contrast can make a good shot look fantastic, and the best photo editors for Android will make the job incredibly easy. The best Android photo editors don't stop there, though – with the right app on your phone, you'll also be able to make dramatic changes with frames, borders, customizable filters and text to get your images ready to share on social media. Whatever you want to do with your photos, we've found the right app for you. Best of all, all these Android photo editors are free to download and use (though some offer extra features as in-app purchases). 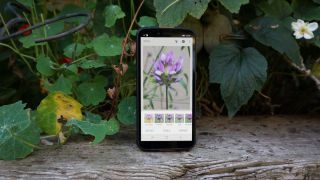 Google Snapseed might have come pre-installed on your Android phone, but if not, it's well worth installing because it's one of the most powerful photo editors in the Google Play Store – and it's completely free. Not only does Snapseed offer all the essential tools for cropping, rotating, and adjusting brightness and contrast in your photos, it's also packed with more advanced options that you'd normally expect to find in desktop photo editors. There's a dehazing tool for removing fog, smart noise reduction (great for photos taken in low light), perspective correction, selective blurring, a healing tool for correcting blemishes, and lots more. You'll need to log in using Google, Facebook or an Adobe ID, but none of Snapseed's tools are hidden behind a paywall. It's a full digital darkroom in your pocket. Adobe Photoshop Express brings a selection of Adobe's best photo editing tools together in a streamlined app optimized for touchscreens. Once you've signed in with Google, Facebook or an Adobe ID, you'll find all the basic editing tools you'd expect, including rotate, crop, red-eye correction and brightness adjustment, plus an excellent selection of smart filters designed to correct common issues, including color temperature, fogging and exposure problems. There's also a wide variety of borders and artistic effects, all of which can be adjusted using simple sliders. Adobe Photoshop Express is also a great choice for making collages, which are a great way to share memories on social media. Once you’re done editing, you can save the finished photo to your device, upload it to Adobe Creative Cloud or share it via a social app. Everything is designed with as much care as you'd expect from the leading name in photo editing, and there are no in-app purchases. Canva is a particularly good choice if you're planning to share photos from your Android phone on social media, with filters and effects that will really make your images shine. The app can automatically crop photos to the correct dimensions for Facebook, Instagram, Twitter and others, and there are tons of templates to choose from and personalize with your own pictures and text. Some options are exclusive to the paid-for version of the app, but there's a huge selection of tools, graphics, templates and effects available free. Best of all, everything is fully customizable. Just tap an element to change its color, size and style. You'll occasionally see ads for the premium version of Canva, but you can dismiss these if you'd rather not upgrade. You may be understandably skeptical about apps that claim to replicate artistic styles, and it makes sense – the 'traditional media' filters included in many photo editors are downright terrible. Prisma is the exception, and once you’ve tried it, we think you’ll be convinced. Take your pick from a selection of different drawing styles and your photo will be transformed into a surprisingly convincing illustration. Sliding your finger over the filtered image will blend it into your original photo, and you can tweak each filter to suit your picture, adjusting the vignette, vibrance, saturation, color temperature and more. Although additional filters are available as in-app purchases (these are marked with a padlock), there’s a generous selection included free of charge. You can share your creations on a special Prisma feed, which works in a similar way to Instagram, save it to your device, send it via messaging or email, or share it on any social media app. VSCO is like a more advanced version of Instagram, it has a community feature that lets you follow other VSCO photographers. You can search for contacts and Facebook friends to follow, but since it’s a relatively niche app, you might not know many other users. VSCO offers all of the tools that you’d expect from a high quality Android photo editing app, including exposure, contrast and temperature correction, as well as a very useful alignment tool for straightening horizons. There are also fade settings, and tools for skewing your image and adjusting tints. The selection of ambient filters isn’t huge, but the ones provided are very atmospheric and are adjustable via a simple slider. Once you’re done, you can share your image with VSCO’s community, send it straight to Facebook, or share it via any social networking or messaging app. The only disadvantage is that you can’t simply save an edited photo to your device; instead, you have to email it to yourself or save it to a cloud storage service.